Let’s start with the disclaimer. What follows is a Bad Idea, you could get blinded, burned, electrocuted or have your house burn down. This is not an exhaustive list. Really, I can’t recommend you try this yourself. The upside is a potential big saving in rechargeable batteries that you’d normally toss in the recycling. The idea of capacitive charger isn’t new and you can buy a book all about it here. Normal battery chargers consist of some kind of regulated DC supply whose voltage is around the final voltage measured across the terminals of the battery being charged. For most batteries this voltage is around 20% above the nominal voltage for the battery once disconnected from the charger and left to rest. For example, a healthy lead-acid battery has a nominal voltage of 2.0V per cell and therefore 2.4V per cell when connected to the charger and having reached the end of the charge (i.e. the cell having reached full charge). A normal battery charger applies a constant current whose value related to the maximum capacity in Ah of the cell. Once the cell reaches full charge the current is reduced / cut off because the supply voltage is limited to the nominal +20% value. There are all sorts of failure modes of rechargeable cells / batteries, many of which can be recovered by an alternative approach that doesn’t limit the supply voltage. For example, in the case of a sulphated lead-acid cell, a high-resistance layer builds up on the plate rendering that cell useless and not rechargeable by a normal battery charger since the charger doesn’t output enough voltage to overcome the internal resistance of the cell. If, however, you had a charger with a much higher input supply, but still current-limited, you could try to overcome this high resistance presented by the sulphate layer. Here’s a non-exhaustive list of the dangers of using this approach to charge batteries. The battery under charge could easily explode and / or burst into flames due to overheating – that’s a very real risk especially with lithium chemistry batteries. When charging lead-acid batteries lots of hydrogen gas can get produced which is an explosion hazard if ignited and also if the cell can’t vent the gas. The charger has exposed high-voltages. Open-circuit in Europe and other countries where we get 230V mains, the charger terminals are at 162V (230*1.4*0.5) with the ability to deliver 1A. That’ll kill you. There are probably other ways that using this battery charger can be a life-changing experience – and not in a good way. This is why you can’t buy capacitive battery chargers as an off-the-shelf item. The current delivered to the battery being charged depends on the value of The Capacitor. My rather rusty recollection of reactance and Ohm’s Law makes me think that for a 230V, 50Hz mains supply you will get 1 Amp for every 14µF of The Capacitor. In USA with 120VAC at 60Hz, you need about twice that capacitance to get the same amp output to the battery. The capacitor must not be electrolytic, tantalum or any other polar type of capacitor. Polar capacitors can explode quite dramatically in this application. You also need capacitors (you might put some in parallel) that are good for the voltage in question, plus a hefty margin. 450V rating is good. Don’t cheap out on the capacitors here – buy Japanese brand from Digi-Key, Mouser, Farnell, Radio Spares (known as RS these days, for the benefit of younger readers), etc. A good example would be the Panasonic resin-dipped PP film ECWFD series. You need a bridge rectifier that’s good to operate at mains voltage and your charging current (with a safety margin in both values). A fuse is a Good Idea. I made a PCB for this circuit with Dirty Board PCB’s. You can buy your own here – ten for $14 – shipped!. Here’s my PCB built up and installed in a box with some connectors for the charging leads and a multimeter. I recycled a power lead from from some scrap appliance. This is really a basic, bare-bones circuit. 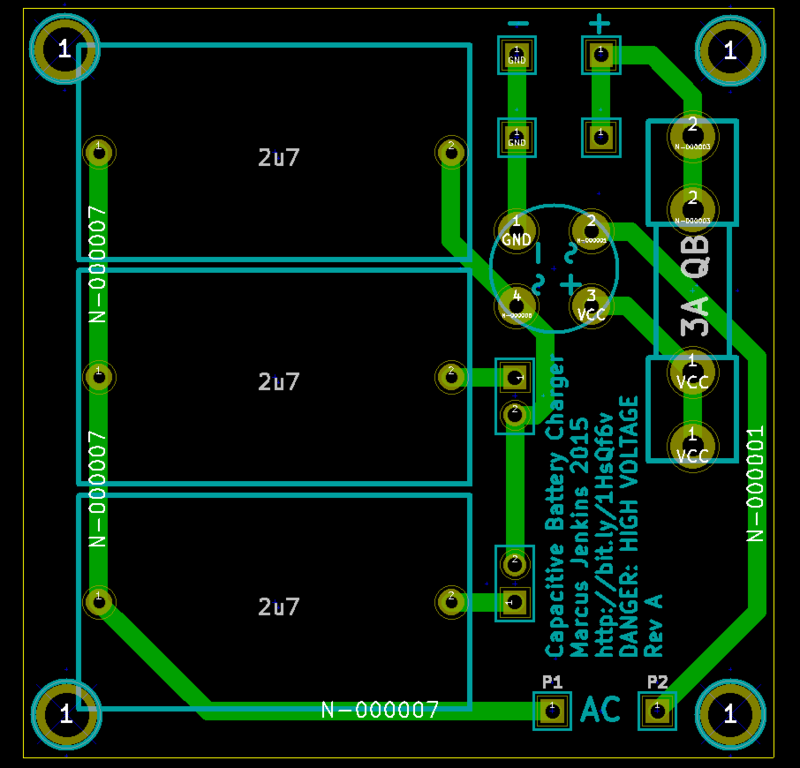 I’ve prepared the PCB with a view that it could be used as a module in a rather more-sophisticated charging system. You could imagine using a microcontroller (e.g. Arduino, PIC, etc.) 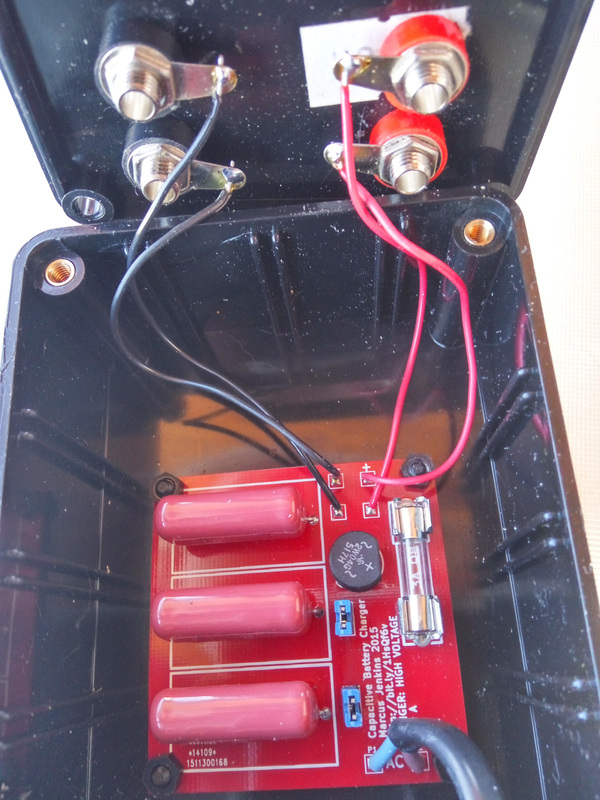 to monitor the battery voltage and disconnect the mains input to the charger module when voltage reaches a user-selectable limit. 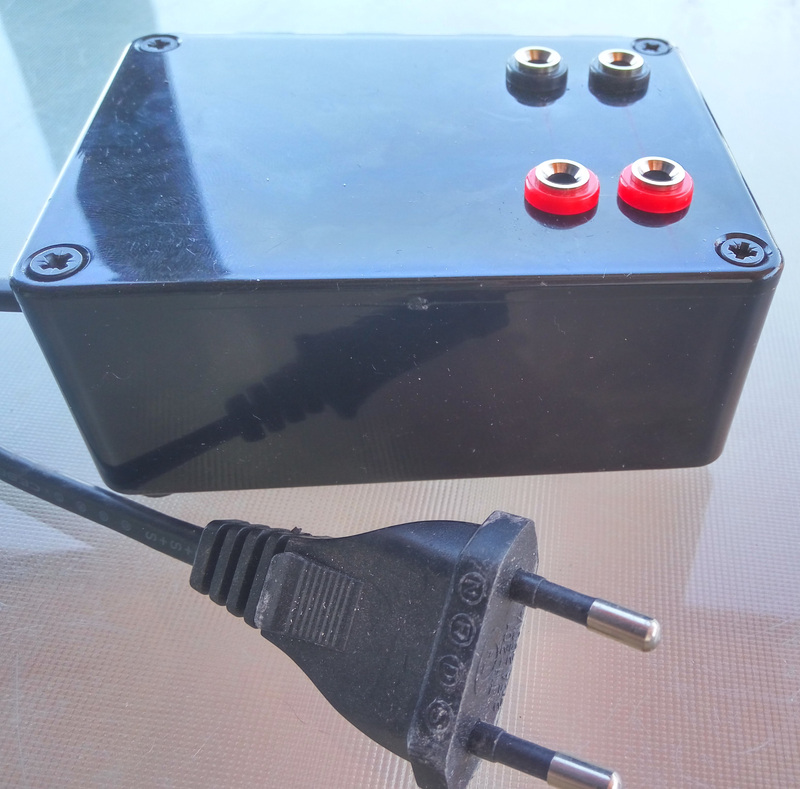 The microcontroller could also have a thermistor probe to attach to the side of the battery with elastic – a basic precaution to try and automatically disconnect in the case unreasonable temperature rise while charging. Neon lamps at both the mains input (perhaps yellow?) and the battery terminals (perhaps red?) might be a nice touch. If the neon at the battery terminals lights up it’s a good sign to be extra-careful to keep your hands clear. Again, I would like to point out that I strongly recommend that nobody do this because it’s really dangerous. However, if you were to ignore my advice, this is how one might use this battery charger. Never touch the charger circuit, the battery terminals or the charge leads once it’s plugged in to the mains supply. Set the capacitor jumpers for the desired charging current. A rule of thumb is that your charge current in amps shouldn’t exceed the capacity in Ah of the battery you are trying to charge. Wear safety glasses. Seriously. Battery acid on your skin’s bad enough but it’s really bad news if you get it in your eyes. When handling the lead-acid batteries there’s a real good chance of plopping some acid out of the cells. A handy fire extinguisher is probably a good idea. There is a sequence for attaching and detaching the charger. For attaching for charge, first connect the charger to the battery observing polarity. Clip on a DC voltmeter with at least 200V range onto the battery as well. Check nothing’s shorting and, in the case of wet lead-acid cells, that they’ve have been topped up and vents opened. Double-check everything. Plug the charger into the mains and watch the voltage. In all cases you need to keep an eye on the battery voltage and temperature. This isn’t an unattended, automatic process. You need to watch the voltage to get ready to pull the mains input when you get to the final voltage for your battery. As a rule of thumb when recovering a bad battery, charge for 15 minutes, watching the voltmeter like a hawk. In many cases the voltage will go up a bit and then stop (well short of the target voltage). In this case, stop charging (unplug from the wall) and leave the setup overnight and try again. This ‘resting’ period seems to do some good, particularly with Ni-Cd and Ni-MH batteries. Disconnection is the reverse of connection. Disconnect from the mains first. Then the battery. It’s a good idea to store the charger with the charger output clips clipped together to ensure that the capacitors are discharged. In some cases the voltage reading may instantly rise to ~100V that might be OK if there’s a cell that’s got a high resistance. You want to be watching for the voltage to quickly come down. If it doesn’t, you’ve probably got a properly-dead battery ready for the recycling. If the voltage is reads maximum (supply times root two divided by two (162V on a 230V mains supply)), you have a complete open circuit. Disconnect from the mains (of course!) and re-check all your battery connections. If it still reads maximum, sorry, again, you have another hopeless case. If you have a gel type battery, I can’t recommend it as being a candidate for this treatment since the gel could well have dried out and I don’t know how you’d go about rehydrating it. The final voltage you are looking for when to disconnect the charger from the mains is 2.4V per cell (~20% above nominal voltage). So, on a 12V, 6-cell battery, that’s 14.4V. So, we’re talking about ‘wet’ lead-acid batteries here. You need to top up all the cells with distilled water before charging and leave the caps off while charging. Safety glasses: use them. Many wet lead-acid batteries are sealed-for-life / maintenance-free. Well, yes, under normal circumstances, that’s true. But we are dealing with batteries where one or more of the cells isn’t doing what it’s supposed to. In fact, these sealed-for-life, maintenance-free batteries are just like any other wet lead-acid it’s just that they have little rubber caps on the cells that allow gas to come out, but not acid. So you need to bust off the plastic cap / cover that hides these from view. Then top up the cells and leave the caps off while charging. You might be producing lots of gas when trying to recover a lead-acid battery. This is because you may only have one or more sulphated cells and others might be OK. So the OK ones are going to be gassing off like crazy while you are recovering the bad ones. When de-sulphating Lead Acid batteries you quite often run into the scenario of starting at an initially-high and getting-lower voltage across the battery terminals while charging. This is due to the high resistance presented by a sulphate-coated lead plate. In this case you need to be extra-careful about the battery temperature since it might get quite hot. In that case you’d want to stop charging (disconnect from the wall first!) and wait for the battery to cool before starting again. These are popular in cordless drill packs. Ni-Cd has a bad name for its memory effect but can deliver a really high current relative to Ni-MH and so that’s why they’re still used. Those cordless drill battery packs usually die way before the drill and so you can often pick them up for next to nothing at a car boot / yard sale. Connecting the charger leads to the terminals can be a bit of a pain. I’ve dismantled packs just to get a good hold on the terminals. If you’re going to be a lot of these you may want to fabricate something that fits your battery pack without dismantling. Again, the 20% rule comes into play. Stop charging when you get to 20% above the voltage written on the outside of the battery pack. The last 5% can come up quite quickly. Take care. I found that the first time I recovered a pretty-much-dead Ni-Cd / Ni-MH pack that the capacity was really (really!) low but started to pick up after I run the charge/discharge cycle a few times which now could be done using the factory-supplied charger again. Sometimes you might need to go back to the capacitive charger if the stock ‘intelligent’ charger decides that the battery’s no good. Watch out for overheating. Use your nose, too. A smell of burning is probably a good sign that you should throw that pack away. It is possible to charge Lithium batteries and battery packs with this charger. It’s also probably the most-likely battery chemistry to burn your house down. I tried charging some Makita power tool battery packs. One of them let out some burning-resistor type smell straight away so I stopped that immediately. Generally, lots of lithium chemistry battery packs have electronics inside to try and avoid burning your house down when you’re charging them with the factory-supplied charger. Said protection electronics probably aren’t too happy to have ~150V applied to them. For lithium batteries stop at 10% above the nominal battery pack voltage and then resume with the factory-supplied charger. Watch for overheating. Really. And take lots and lots of fire precautions. Search YouTube for videos of flaming / exploding lithium batteries if you want to get some idea of what you need to prepare for. So far I’ve revived about half a dozen Ni-Cd cordless drill packs, a couple of Ni-MH cordless drill packs and had a go at a Li-Ion drill pack and a 220Ah lead acid battery. The results are still not in for the Li-Ion and big lead acid batteries. A friend of a friend has a load of Hilti brand Ni-MH battery packs he wants me to try out – the list price for the replacements is ‘reassuringly expensive’. Don’t try this yourself. If you were crazy enough to do so, you’d be doing so at your own risk and I think I’ve warned you enough. I told you not to do it so I don’t take any liability for consequential damage, injury or death if you’re dumb enough to try this out yourself. You can order PCB’s for this project here.